As stated in my previous blog post, my computer has been out of commission (rest in peace dear charger). I still don't have a charger, so blog posts may become a bit slow/sporadic. Please bare with me during this time until I can get my hands on one! So a few things to write about today. For one, I woke up to an email from Chictopia. Bloomspot is giving one lucky winner $1000 to shop at Sephora! I signed up right away and I encourage you to do the same. You can use this link here. Secondly, I wanted to thank anyone and everyone who have read my blog. I ask that if you enjoy what I write and want to be supportive, that you follow me on bloglovin'. Links can be found at the top of the page and over on the right hand side of the screen. If you don't have a bloglovin' account, then perhaps follow my blog of Google Friend Connect, which can also be found on the right side of the screen. Lately, the weather has been very poor. Lots of sudden storms have made wearing dresses and skirts nearly impossible. There's nothing cute about having them cling to your legs and in a sudden downpour! The one on the left is very girly and very simple. The one on the right isn't 'girly' per se, however it has a really classic look to it that never goes out of season or style! Lately I've been focusing on clothing. However, today, I want to talk about something else close and dear to my heart...and probably the heart of most females around the world. Shoes are, in my opinion, really great accessories. They can make an outfit and they can 'break' an outfit. I tend to stick to type of shoe, sadly. Flat and comfortable. Nothing wrong with this, but with more girly clothing, I want to try something new! Don't get me wrong, I'll wear heels. When I have to. I love my black Steve Madden pumps that I wear with anything that require I dress up a bit. However, I want something new. Something different for this new image of myself. I'm growing and evolving again into a girly me. They aren't the most out there shoes. They aren't designer or name brands. However, I think they are cute in their simple designs. Less can be more sometimes! It's a place for me to start. I'll continue looking and finding clothing, shoes and accessories that speak to me. 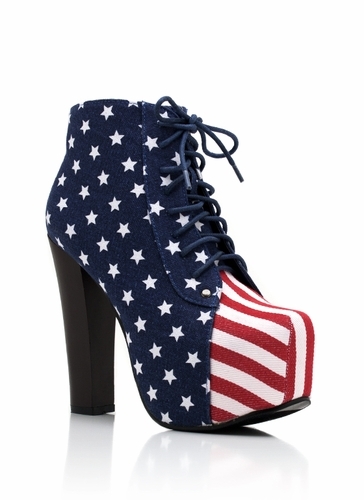 This bootie doesn't portray the image of femininity that I'm trying to achieve. However, I just liked it. And there's nothing wrong with that! Today I'm going to continue my post from yesterday. Since I was a bit under the weather, I was unable to do much but today I'm feeling a lot better. Thank you everyone who sent well wishes my way! Yesterday I posted a few outfits that I've fallen in love with because of their simple styling and feminine touches. This first outfit is very simple. I love the the fun of the dotted material of the dress and the way it easily flows. Also it has a empire waist which I find to be flattering for most figures. Where I live the days are still quite hot and the evenings can get to be a bit chilly (for me at least). This will last until late October more then likely. during the day but adds a bit of extra protection for the chilly night. Lately I have been spending a lot of time at the beach because my fiancé is stationed out that way. To me, outfits like this are perfect for outdoor dates. It has a nice romantic feeling to it while still being casual. It is perfect for picnics in the sand or at a park, or even a nice restaurant and a movie. Being paired with a nice jean jacket, or a white cardigan or white long sleeve tunic type top can make this a great outfit for cool nights by the beach as well! a combination of the first and second dress. This last outfit is literally just about perfect for anything! A night out on the town with friends, work, dinner parties, a fun day shopping. There are lots of separates as well, so pieces can be used over and over in hundreds of different combinations depending on what you have in your closet already! So that pretty much sums up what I wanted to write for yesterday! Thank you for reading this! I hope that as time continues, my posts will become more and more interesting. I noticed that I am focusing a lot on very girly and romantic looks, and I guess you can really see that my heart tends to be all about Asian fashions. The more I think upon it, the more I think this is what I would like to focus on. What are your thoughts on this? Is this something you, the reader would be interested in? Please feel free to let me know in the comments! Today I'm feeling a bit under the weather so I don't have it in me to write very much. Instead I'm just going to post a few pictures of outfits that I've seen and fallen in love with. Hopefully tomorrow I will feel better and be able to speak on the reasons I like these outfits so much! The rest are from CatWorld. Continuing from yesterdays blog post about my newly found love of frilly and girly clothing, I want to take some time out to write about an extra special love I have found. Hold on wait a minute. Those things my mom forced me to wear that was some creature combination of a skirt in the front and shorts in the back? Kinda like a mullet? Or a spork? I guess I can't say they are a new love but rather a love I never knew I had. Skorts were the compromise between my mom I think. I'd have to ask her though to be safe. She got the super girly me in a skirt and I still got my shorts. But let's not reminisce in the past, I'm here to talk about my feelings for them now. I love them now. It's really as simple as that. They have so much going for them! Their cute designs, the fact that they can be worn at anytime of the year and then how practical they can be. You can run and jump and play (I can still do all these things as a 20 something year old, don't question it) and you won't have to worry about exposing yourself to the world! Now there are two types. There are your traditional skorts; skirts on top of shorts or shorts with the weird annoying flap. And then there are culottes. Culottes are shorts that are made to look like skirts. At least that's how I tend to think of them. These first five images are actually culottes. 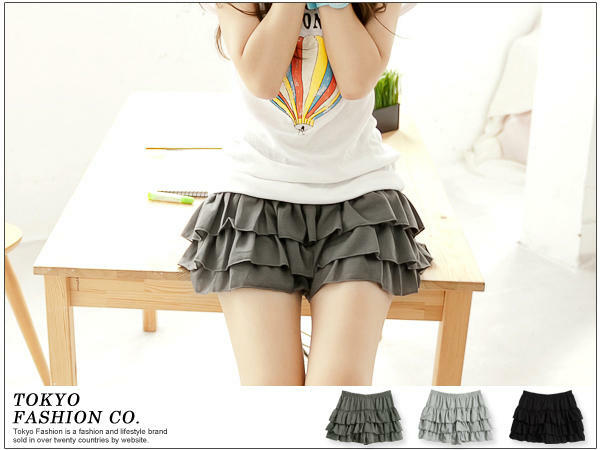 They look like cute ruffly skirts but are in fact cute ruffly shorts. I stumbled upon them today as I was going through Yesstyle.com. I found them from a Japanese brands aptly named Tokyo fashion. As you can see, they work for all times of the year. Just add some tights or over the knee socks, boots and a cute sweater and you have a nice girly look for winter. Add a cute casual blouse and you have a nice spring/summer outfit. With a wide brown belt and cute denim jacket, the same bottom can give you a nice fall look! This one above is actually the only literal or true definition of the word skort I've shown today. It's literally a pair of shorts sewn under the skirt. Just like the other examples shown above, it too is great for all times of the year. Liz Lisa, the Gyaru Japanese clothing store I mentioned in my post yesterday has some really great skorts that are on sale all year round. Also, I want to let everyone know that I've started a tumbler for my blog. It can be found here. It's the first one I've ever done so please treat me kindly! Hi. I'm just a silly girl trying to stay young forever. In my mid 20's, my life is opening a new chapter and I'm ready for whatever it might bring. I'm exploring my passion for Asian culture, fashion, all things cute and pink while taking on the role of Marine wife. Each week I'll choose a winner and your recent gallery could end up here!